Mainstream media and climate alarmist websites have been publishing a lot of nonsense about record and near-record surface temperatures in Alaska over the past few weeks. In Fairbanks, the “near-record temperatures” are expected Wednesday and Thursday to clock in at 91 degrees. Temperatures above 90 are extremely rare in Alaska. Fairbanks has only experienced 90 or above 14 times since in 109 years. The record in Fairbanks is 95 degrees set back in 1915. If the record was set in 1915, why would anyone be worried about Alaskans receiving the gift of sunbathing weather? Let them enjoy it in peace. A large northward bulge in the jet stream is to blame, consensus shows. Why that has occurred is more hotly debated. Some scientists tie the jet stream’s odd behavior on climate change. Others don’t make the connections directly, instead seeing random weather or long-term cycles at work. And even more scientists are taking a wait-and-see approach. I wonder if Sophia Rosenbaum dropped by Steve Goddard’s blog and found the past newspaper articles about the high Alaska temperatures in the 1930s and in the 1950s. The author of a SkepticalScience post, on the other hand, is not that well balanced…in his news roundup. 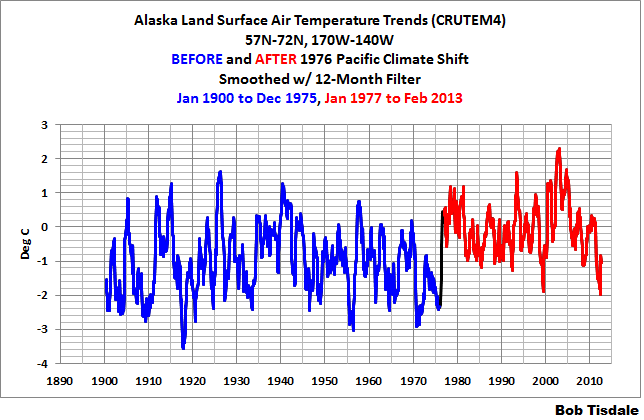 It’s easy to see when and why Alaskan surface air temperatures warmed. Based on linear trends of the recently released CRUTEM4 data, land surface air temperature anomalies were relatively flat in Alaska from 1900 to 1975, and from 1977 to present, they’re flat again. Between those two periods was the Pacific Climate Shift of 1976, which, in effect, raised Alaska land surface air temperature anomalies in the neighborhood of 1 deg C. See Figures 1 and 2. As you’ll note in Figure 1, in addition to the one in 1976, there appear to be other shifts in the land surface air temperature anomalies of Alaska, like in 1911 and 1934, and possibly 1957 and 2001. Between the shifts, surface air temperatures decay, gradually cooling after each shift, except for the recent period, when surface temperatures are cooling quite drastically. Unfortunately, the UKMO CRUTEM4 data lags a few months at the KNMI Climate Explorer. 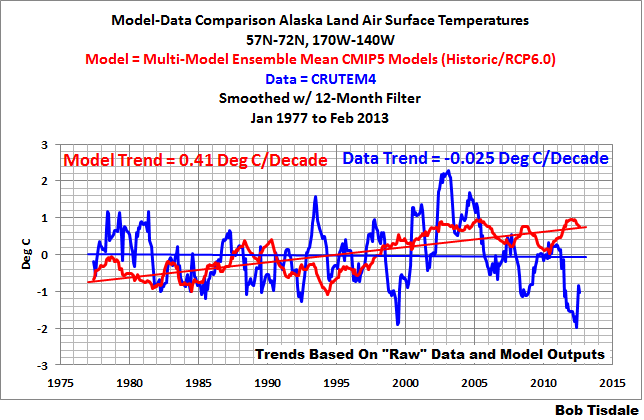 So, how well do climate models simulate Alaska land surface temperature anomalies? The outputs of the climate models stored in the CMIP5 archive are also available through the KNMI Climate Explorer, though you may have to sign in to access them. For the period of 1900 to 1975, the climate model performance is kind of good (relative to the most recent 35 years). The difference in the observed trend in Alaska surface temperature anomalies from 1900 to 1975 and the trend of all the ensemble members of the climate models stored in the CMIP5 archive (models used for the upcoming IPCC AR5) is only about 0.06 deg C per decade, with the models showing warming and the data showing no warming. 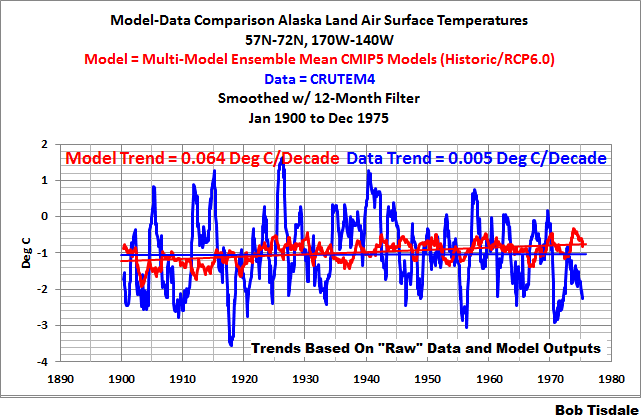 However, according to the models, if manmade greenhouse gases were responsible for the warming, Alaska land surface air temperature anomalies should have warmed about 1.4 deg C since 1977, based on the linear trend. See Figure 4. 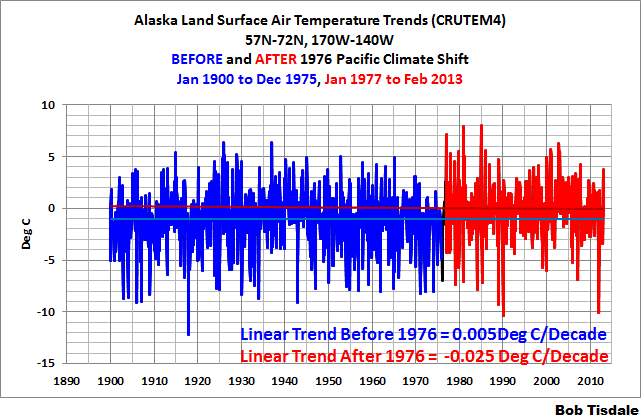 But land surface air temperatures in Alaska have not warmed since 1977, also based on the linear trend. In fact, over the past couple of years, Alaskan surface air temperatures have been dropping rapidly. 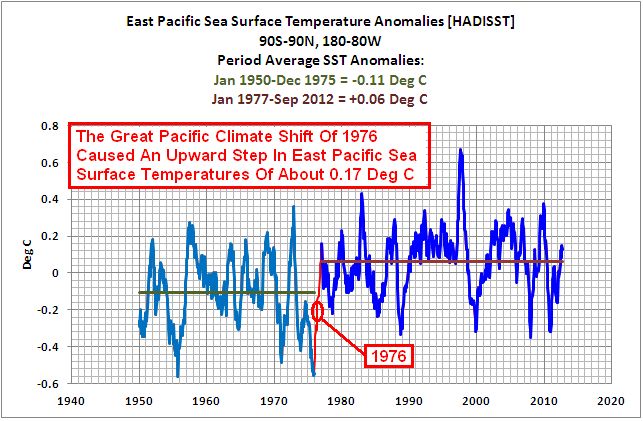 And we recently showed in the post Meehl et al (2013) Are Also Looking for Trenberth’s Missing Heat that the climate models used by Meehl et al (2013) show no evidence that they are capable of simulating how warm water is transported from the tropics to the mid-latitudes at the surface of the Pacific Ocean, so why should we believe they can simulate warm water being transported to depths below 700 meters without warming the waters above 700 meters? Many thanks to all who have suggested titles for my upcoming book about the extremely poor performance of climate models being used by the IPCC for their 5th Assessment Report. I’ve been toying with another title based on a comment I recently made on the thread of a WUWT post by easy-to read, always-informative Willis Eschenbach. Dr. Fredrick Frankenstein cries out in reply, “My grandfather’s work was doo-doo!” See the YouTube clip here. So right now, the working title is Climate Models are Doo-Doo, with the subtitle An Illustrated Overview of IPCC Climate Model Incompetence. And for the cover art I’m thinking a cartoon by Josh with Barack Obama asking, “But what about climate models?”, and a cranky old pensioner replying, “Climate Models are Doo-Doo!” Maybe with Obama feeding billions of dollars to a mainframe that looks like the Frankenstein monster and a diverging model-data graph of global temperatures behind the frazzled Billy Connolly-looking pensioner. This entry was posted in Climate Model Problems, LSAT, Model-Data Comparison LSAT. Bookmark the permalink. Pingback: Model-Data Comparison: Australia Land Surface Air Temperatures & Anomalies | Watts Up With That? Pingback: Models Fail: Scandinavian Land Surface Air Temperature Anomalies | Watts Up With That? Pingback: Models Fail: Global Land Precipitation & Global Ocean Precipitation | Watts Up With That? Pingback: Part 1 – Comments on the UKMO Report about “The Recent Pause in Global Warming” | Watts Up With That?